/he·pat·ic/ (hĕ-pat´ik) pertaining to the liver. 1. Of, relating to, or resembling the liver. 2. Acting on or occurring in the liver. A drug that acts on the liver. noun A medicinal preparation, usually of herbal origin, used to “tone” and strengthen the liver, increase the flow of bile, and aid in hepatic detoxification (as defined by alternative health practitioners, rather than mainstream physicians). adjective Pertaining or referring to the liver. Of the liver, from the Greek hepar. adj 1. pertaining to the liver. n 2. a substance that stimulates healthy liver and gall bladder function. The volatile fatty acid (VFA) concentrationThe plasma VFA concentrations of portal, hepatic veins and femoral artery are given in the Table II. Mechanisms of liver involvement in leprosy include: infiltration of the liver by leprous granulomas, immune complex mediated injury in lepra reactions (Type 2) and drug induced (MDT) hepatic injury. Calculations: Portal and hepatic plasma flow rates were calculated from the plasma p-aminohippureate concentrations as described by Katz and Bergman (1969). Ultrasound proved solitary hepatic lesions studied from January 2016 to August 2017 was set as inclusion criteria. 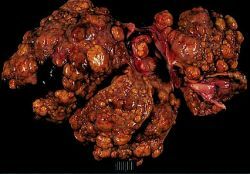 The parenchyma was further divided into multiple hepatic lobules surrounding the capsule; however, the hepatic lobules were not obvious, the hepatic portal area was highly prevalent. Hepatic pregnancy suspected at term and successful delivery of a live neonate with placental attachment to the right lobe of the liver. Keywords: Hepatic resection, Outcome, Morbidity, Mortality, Developing country. Presentations vary from the incidental discovery of hepatic abnormalities in asymptomatic patients to the onset of fulminant hepatic failure with rapid progression of encephalopathy to coma and death. In the remaining 10 percent of cases, primary hepatic lipidosis can occur if a cat does not eat due to stress, diet change or inability to get to food, leading to a severe lack of caloric intake. This is a high-risk surgery as the surgeons need to have a good understanding of the functional segments of the liver and excise the tumorous portion without damaging the hepatic artery, portal vein or biliary drain system. KEY WORDS: Doppler waveform, Octreotide, Hepatic vein, Portal hypertension.